Captain Seth can best be described as a passionate sportsman who has never met a stranger, and loves to share his knowledge. Quick with a laugh and professional on the water, you'll be pressed to find a harder working guide or with a more infectious enthusiasm for angling. A native Texan, Seth arrived in N.C. in 1997 seeking an education in the Blue Ridge Mountains at Appalachian State University. In 1998, fishing guide and friend, Ollie Smith took Seth on as a rookie guide at Foscoe Fishing Company. A fly fishing addiction was spawned and Seth began professionally guiding trout and smallmouth anglers on the rivers and streams of the high country and tailwaters in neighboring Tennessee. After guiding for several years out of Boone, NC and traveling to fish western rivers the allure of wild fish in wild places led Seth and his bride, Francesca, in 2002 to work for one of Alaska's premier fly out fishing lodges, Mission Lodge. Here in the heart of Bristol Bay, Alaska under the tutelage of famed guides Bobby Kratzer and Wally Adams, Seth cultivated new skills as an outdoorsman and techniques for fishing steelhead, salmon, trout, char, pike and grayling. 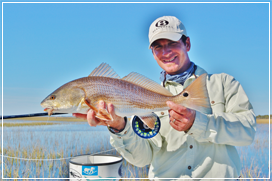 In 2004 Seth and friend Stuart Smith partnered up to operate Intracoastal Angler, saltwater tackle purveyors in Wrightsville Beach, NC. 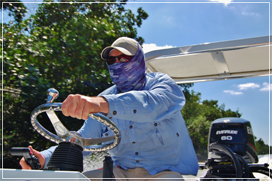 Seth began investing his energy into learning the tackle, techniques and local waters both from the poling platform as well as the cockpit of sportfishing vessels plying the gulfstream. With the seemingly endless bounty of pelagics to fish for as well as a burgeoning shallow water scene being developed, Wilmington became home base and provided an excellent learning environment. It seemed logical that the next step would be the creation of Double Haul Guide Service in 2006. By 2008 Seth had begun to work on a film exploring North Carolina's state fish, the Red Drum. Working alongside director Luke Pearson, of Lift Films and angler Josh Eddings, Seth found the experience to be both challenging and rewarding. Redfish Can't Jump debuted to a packed crowd in Wilmington at Level Five in January of 2010 and went on to receive critical acclaim. The film has made a tremendous impact in the angling community in NC and the quest for gamefish status as well as the removal of gill nets in NC waters.